When Colin McRae tackled the Dakar in 2004 with Nissan, the entry attracted a lot of interest from Motorsport fans and followers world wide. To quote the Guardian, Few drivers have created such a stir by finishing 20th in the Dakar Rally. But while the result was unremarkable, Colin McRae's approach to his first attempt at the world's toughest rally won universal praise and if he carries out his promise to come back and win, he can take his pick of the leading cars. The 35-year-old Scot finished with a flourish, setting the fastest time on yesterday's 15-mile final stage along the seafront in Dakar itself. He was no fewer than 41 seconds quicker than the Schlesser buggy of the early leader, Josep Maria Servia, as the leaders cautiously nursed their cars to the end. 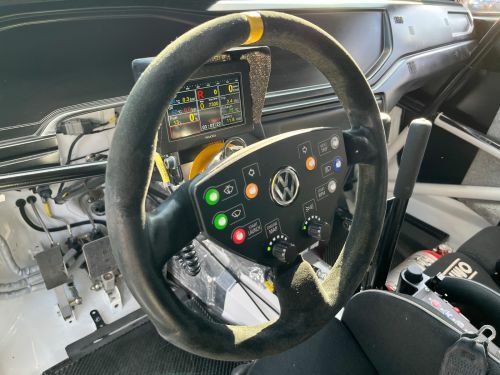 It was McRae's second-fastest stage time of the rally and a reminder of his raw speed, but much too late to make up for severe mechanical problems earlier in the 6,932-mile, 18-day marathon. Nissan built a replica of the McRae car for publicity and promotion, using a brand new Nissan Navara, the car looked the part, and attracted attention wherever it was displayed. After many years in dry storage, that car is now offered for sale, and offers are being invited. There are no registration documents with the car, it has never been registered. The vehicle appears to have never been driven on the road, the bodywork is very straight and tidy, with all external components being an exact replica of the real Dakar cars, even down to the tow hooks. Included with the car are a full set of Radflo Rockcrusher Coilover Dampers. These are period correct units that have been in storage as long as this car. There are several possibilities for this car, it would make an excellent project to transfer all running gear from a tatty Nissan Navara, and result in an eye catching off-road vehicle. Inspection by appointment only, and offers are invited.